It is my understanding *****no cfr here****that religion in general is losing its appeal. It's easy enough to look up. There's a lot of nonreligiosity going around. Don't know what this says about other European countries, but I think it holds true all over. My wife visited Prague a week ago, and there are practically no churches (and Prague has many that are architecturally beautiful) are being used as churches any longer. Europe varies in religiosity. Romania is the most religious, with Malta not far behind. I think that the American society has just become more secular, and doesn't see a way of believing in evolution and God, for instance. I believe that is the major trend, but you do see a shift in the evangelical churches towards singing services, Christian bands, and other forms of consumerism. I wouldn't worry too much about the message. I think that issue will change soon enough. Wow, I just cut from a post again! That is two times in a row! I am on a roll. Quick comment - I don't quite agree with you that the nature of singing services is consumerism. In attending the ward, the thing I miss the most is the musical aspect of the worship experience. You may be talking about the emphasis on worship teams, bands and the like. If that is it, I agree with you. What I miss is in a sense, the beauty of acapella singing. I love music. I love hymns. It may just be a function of our particular ward, and I mean no criticism, but I think music could be a much greater and more meaningful part of the worship service than it currently is. Once a month on a Sunday night we had a hymn sing where for an hour or more we would learn about our hymns, the authors, the stories behind them and then join together as a congregation-choir to sing quietly and reverently, joyfully or enthusiastically, whatever was called for; followed by snacks and refreshments. I do miss that. The song in the link I am enclosing was kind of the national anthem for Mennonites. We sing it regularly in services. This is a group attending a local conference to give you an idea of what I mean. I know there are amazing LDS vocal groups - I am simply referring to regular Sunday in and out music in services. I hope you enjoy the song! There are various pressures to get rid of people on the records who aren't members in any real sense. Don't know what the current incentives were, but when I was a kid often ward splits and so forth required more accurate information about members of record. I know in the 90's when I was ward hopping a fair bit since I was single I'd regularly get contacted by SLC asking where my ward was and if I still considered myself a member. So the idea that it's all people who haven't self-identified as Mormon is I think wrong. Something is keeping the number from becoming too inaccurate (which we'd expect over time if people weren't ever eliminated from records). I've no idea what contemporary policies do to update such figures. I know back again when I was younger they actually had leadership try and find people and sign that they weren't members - but that was in the days when it was tied to budgets too. I know there is pressure to keep local rolls clean--on my mission, I was once in a ward (yes, it was a ward) with 10 people that were marginally active and 350 that were inactive. I get the impression that the Church believes whether or not somebody's name is on the rolls of the church has soteriological implications. Thus, they really don't want to officially remove any names as being actual members until they are absolutely certain that the person wants their name removed and understands the doctrinal implications of forfeiting membership in the kingdom, or are absolutely certain they are dead. I have no idea what the basis is for this, but people always say that there is a "lost members" file that has members who don't belong to any specific congregation, and that they won't presume the people on that list are dead until age 110. If 25% of converts end up on that list, there could now be well over a million members of the church who don't belong to any congregation. I recall a few decades ago when the Church was pushing hard to be officially recognized as an option on the Chilean census. They claimed to have something like 400,000 members in Chile, and proudly issued a press release about how big and important they were when the name of the Church did in fact appear on the census questionnaire. After asking every man, woman, and child in the country what their religion was, about 80,000 people self-identified as Mormon. What are the soteriological implications of not being on the roll of a LDS ward? What are the doctrinal implications of forfeiting membership "in the kingdom?" To clarify, the doctrinal and soteriological implications are only about whether or not you are a member--not whether you are on the rolls of a specific ward. As I understand it, having your name removed is considered reneging on all of the covenants you've made in the church at baptism, priesthood ordinations, and at the temple. At the very least it causes you to officially lose all of the associated promises. At the worst, there are implications that walking away from your covenants puts you in Satan's power. Just to be clear, I would like LDS meetings to have more emphasis on music. I too love music. The biggest weakness I see with Church services is that wards are generally too small to support a good choir. Choirs are happy if anyone shows up. There is little to no room at the ward level for real choral teaching. I miss the vocal teaching I received at the collegiate level, and the chance to perform major musical pieces. Now if I could join the Choir at Temple Square, I'm sure I would get it, but that involves a major time and financial commitment to pay for trips, etc. And most members just don't live close enough. To me, music is almost an afterthought in the Church. Population growth tends to follow a logistics model. Initially the model appears to be exponential, but then it starts to level out. It's impossible for a population to grow exponentially indefinitely because of finite resources. The leveling off appears to be happening during this time period. Notice the bars below the line before 1990 and after 2013. Sometimes when you zoom in on a curve it might appear linear. I entered the LDS membership data from the original 6 members to 2017 into my graphing calculator and performed a logistics regression and this is the result. In order to see the curve through the data points, I plotted every 5th year after generating the equation. That is not the truth. Maybe some who leave fit into this category, but most I have known do not. We are having local leaders and very strong, active members struggling with a faith crisis and trying to remain active....or going completely inactive. It's not mainly the ones with "weak or not testimony". That is not an accurate assessment at all, IMO. I have a feeling that you're wrong about this. The parable of the sower covers the subject quite well, I think. The seed falling upon rocky ground, where the seed sprouts and prospers for a time, but then dies from lack of soil seems to apply here. Just because a man or woman is a strong local leader does not immunize against a faith crisis -- how strong is one's testimony? If it is not strong enough (i.e. "weak"), no amount of faithful attendance, hard work, and gospel knowledge is going to stand one in good stead in the face of "information" that seems to contradict one's beliefs. Unless one's testimony is strong. Let's say that a person is newly baptized, and starts attending church, telling his friends and relatives about what he has found. And one of these people are alarmed at what has happened, and hands the new member a copy of "No Man Knows My History". He reads it, becomes convinced that he was wrong to join the Church, and leaves. Why? Because his testimony was strong? No! Because it was weak. Don't mistake busy-ness and mere activity for strength of testimony. As has been pointed out in other threads, there are apparently some stake presidents and bishops, for example, who do not believe in the truth claims of the Church -- their testimony is not from the Spirit, but perhaps their participation is either socially-based, or they believe that even if the Church is not "true" it is nevertheless a worthwhile organization. And so they stay. What will it take to cause them to abandon the Church? It might be something coming around the corner, this year, next year, or in three years. Or maybe they'll stay despite their unbelief. Personally, I believe that the condition of the world in coming years will shake many of those whose testimonies are weak out of the Church. Because their testimonies are weak -- not strong. Which is an argument in favor of strengthening one's testimony, not a condemnation of those whose testimonies are genuinely weak. Or nonexistent. I take it all back. I 100% agree with you. I have never seen or been to an evangelical or fundamentalist service that did not have a preaching/teaching component, nor would I want to. Music complements the teaching of the gospel. It will never replace it. I think we agree on that. Musically yours, Navidad! Clark, as always raises some great points. I wish he would also post a lesson on how to quote previous posts. I absolutely cannot figure out how to do the quote thing without quoting the whole thing! Write your response after splitting the quote with Enter. Anyway, I am wondering if any of you are confident that you know and understand who the current target population is for the missionary? Are they given different training on how to present different material to different folks? Does the missionary sent to a Bible-belt town get the same training and use the same material as one sent to a Shinto country - just in different languages? I often agree with the pride of the Church in that it has wonderful training for language skills. Both groups (Saints and so-called Christians) don't really understand the other, do a lot of parroting, and have terrible sensors in place as to whether the other is even listening anymore. I think both groups are equally bad in their "conversion of the other" efforts. tada! If you want to delete a quote box you have created, move your mouse pointer to the "Quote" in the head of the box, and then hit your <Ctrl> key while right clicking at the same time, and a box will pop up giving you options of what to delete. Now you should be quote box savvy! Very good! Didn't see this before I made and posted my video. Sometimes when you zoom in on a curve it might appear linear. Every smooth function looks linear on short scales, yes. All smooth curves become lines, when you zoom in. That's good to know, but even better is to understand why it is so. It's called the Taylor series. If you've never heard the term, you might Google it; if it rings a faint bell, you might review your freshman calculus. As you narrow the range over which you are looking, the higher order terms in the Taylor series all get smaller faster than the linear term. So if you narrow your view range enough, the linear term will be all that is left. Church growth looks linear over at least 25 years. During this time the church increased in size by a factor of more than 250%. This is not just zooming in on a smooth function. It is not taking a narrow field of view. It is not a small total change. Church membership more than doubled by marching steadily up a straight line for a generation. If you don't want to recognize a pattern so clear and simple, why are you even trying to analyze data? What's the point of the exercise, for you? If this strikingly linear growth doesn't count for you as finding something, what kinds of patterns are you hoping to find? So how strong is one's testimony? A testimony can be extremely strong and faithful until one learns that what they had believed in is not the truth. Then they struggle, pull back and re-evaluate. You might have a very strong testimony that a car you own is the best built in the world. Then you read about issues the manufacturers had but didn't reveal to the public. Then your car starts struggling to run as well as it once did. Will your testimony still be as strong regarding your original belief after that? That may not be the best analogy....but I hope you get my point. Testimonies can evolve and change when new facts come out. That does not mean one did not originally have a strong testimony. Also, one has to look at how others seem to believe in crazy nonsensical things and then evaluate one's own beliefs asking whether or not theirs is crazy and nonsensical like those other people's beliefs seem to be. 25 years is small when compared to 189 years. The size of the increase is irrelevant to whether something is linear. At the midpoint of a logistics curve the data seem to be linear. After the midpoint, the curve starts leveling out. Note the last five years the increase in members has decreased from the previous year. This is clear from the charts in the linked article and from your graph. I should add that there is another way to sometimes do this easily, but I'm not sure if it is just a software glitch or what. Sometimes when I hit the "quote" link to start a new post, if I then go directly into the quote box where I want to split my comments on the poster's quote, and hit the <return> key 2-3 times, the present editor software will split the quoted post into a second quote text box below. This saves having to open a new quote box manually, cutting and pasting, and also saves the actual quote heading. I can't always get this to happen, so I am not sure why this works sometimes, and sometimes the original quote box just gets longer.... maybe it is a "feature" of my present internet browser. If someone knows how to always get this to work, it would be great to hear from you. If something weird is going on for 25 years, I don't stop wondering why just because longer time scales also exist. For heaven's sake: this is a steady linear trend that persists across a total change of over a hundred standard deviations in the annual change! A linear function can have any slope, but the size of increase is certainly not irrelevant to whether something is linear. It sounds as though the Taylor series stuff didn't mean anything to you. If it really didn't, we're going to have a hard time discussing functions. Perhaps you could read the Wikipedia article on the subject? It's pretty clear, I think. At the midpoint of a logistic curve the curve looks linear ... because it is linear, there. A curve can't appear to be linear but be nonlinear deep in its soul. Curves don't have souls. They're just shapes. The way they look is the way they are. In this case the church membership has not grown linearly throughout its whole life, and it may well have stopped growing linearly in the past few years. Lots of things do show changes over time in the way that they grow. There's always a reason, however. Exponential growth levels off because a population reaches the limit of its food supply, or a predator species proliferates, or something like that. Scientists don't plot logistic curves and then simply sit back smiling as if the curve itself constitutes its own explanation. We ask why the growth is exponential in the early phase, why it straightens out into linearity, and then why it plateaus. We consider each of those questions important. If growth stays linear for an extended period, we wonder what's stabilizing the system in that behavior. While I understand those who see the data as a tapering off log curve, I confess on the face of it this seems difficult to accept. For the simple fact that it would suggest that the population curve is completely unaffected by larger social trends like the rise of secularism in western Europe and the more recent moves against organized religion in Canada and then the United States. That just seems pretty difficult to accept on the face of it. It would also suggest the underlying forces are so great that even choices in organization, such as missionary program decisions, don't affect the curve. So while mathematically we might get a nice curve, in terms of what's generating the numbers, it's pretty difficult to accept theoretically. I think this, like the linear line, is a bit of a coincidence due to temporary factors that may themselves change. That's why I'm more than a little skeptical of your graphs since it'll imply that the stable population number is itself a fixed figure unrelated to social events. I think that's reading it incorrectly. This is a bit orthogonal to the membership number issue, but I'd say a strong theological view is that if someone doesn't fully understand or is incapable of living their covenants that they'd be better off not being under that requirement. You see this in discussions of Church courts and why they're called "courts of love" much to the ridicule of many. But there really is a strong theological position that taking people out of covenant is a blessing not necessarily a curse. Again looking at things as a process and not and event. Not everyone agrees of course. I just raise it to partially explain why getting people off the roles makes sense. I agree somewhat, but note that talking points of critics get brought up in conversations, etc. Heck the whole "Letter to a CES Director" is an internet phenomenon I think. It seems the internet played a part in the general societal shift imho. Yes, I agree the societal shift began in the sixties before the internet, but again imho, the internet has increased it. That is not based on actual statistics, which I think would be hard to come up with. It is just based on my observation. I think people who are on the internet a lot in discussions overestimate how many people are seeing the things they are. If, for instance, the CES Letter (2015) is this phenomena then I think we'd be able to discern its effects more specifically in the United States whereas I just don't see that. I'm certainly open to it. But even if the CES Letter is this amazing phenomena, what does that say of the effects of the internet the prior 20 years? I don't want to say it doesn't have an effect. It clearly does. But I think the effect is very much exaggerated especially when considered against the background of larger social trends and demographics. Wow. You don't seem to like the changes in the missionary program started by Monson. I agree the younger generation is different. They pose new issues. I think it clear that their concern isn't baptism numbers but conversion of the missionaries and the long term trajectory of those missionaries. That's not a wrong choice and it's certainly not my choice to make. But clearly it has predictable consequences. However, I don't see catering to their consumerist desires to be entertained.﻿ To the extent that they continue﻿﻿ to expect their religion to be entertaining or to present solutions to all their "problems" or to bring them prosperity, I think the Church will continue to suffer in their conversion rates. I agree and I'd also say entertainment isn't the right word, although clearly for some that's what they seek. But overall society, especially younger generations don't think in terms of responsibility the way older generations did. I think that some members view a tapering off as an indictment against the Church. I don't. When a population reaches the saturation point, growth slows down. If a population curve was unaffected by other factors, every population curve would have the same equation. The saturation point for one population will likely be different than for another. These factors help shape the curve and have been since the Church was founded. Can new factors adjust the curve? Absolutely. Perhaps President Nelson is trying to create new factors that will delay the leveling off. There is a graph on lds.org that looks just like the one I posted (we used the same data). I suspect the Church has some statistics dudes working for it who have informed the brethren about this inevitable leveling off and they are trying to avoid it as long as possible. Thanks so very much. That was very kind of you to take the time to help me. I learned more from watching your link. I appreciate your time and kindness. I appreciate all the time and effort you all have put into this thread. I don't think the tapering off of the growth should be viewed as an indictment. It seems an inevitable trend. The only other question I have for you data brainiacs is that it seems that if there are 109,000 or so new children of record every year who are included in the membership numbers as reported, then at any point there are at least 800,000 children of record included in the membership numbers. There must be 8 cumulative years-worth at any point in time (from birth to eight years of age). A group drops off and a new birth/ blessing group are added in. Is this correct or am I missing something? My only reason for bringing this up is for reliability purposes in making comparisons with other Christian groups who do not baptize babies into membership, nor count the equivalents to COR's in their membership records. For comparison purposes, doesn't including the 800,000 or so children prior to their baptism skew the number of members data? Thanks. One more idea. 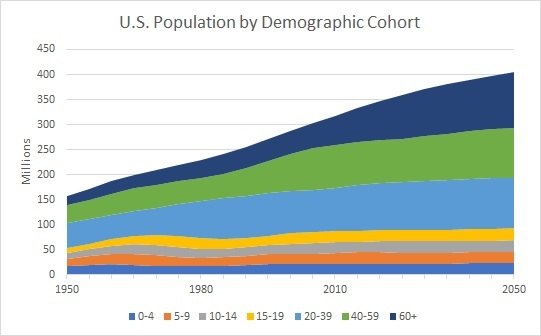 The following graph shows the growth of the U.S. population by age cohort. Each area shows the total population for a cohort--ages 0-4, 5-9, 10-14, and so forth. As you can see, the total number of people under the age of 20 has reached a steady state. However, the total population is continuing to rise. This is partly due to immigration (the gradual increase in people from 20-59), but is mainly being driven by people living longer (the relatively steep increase of people in the 60+ cohort). Perhaps there is a similar trend in Mormonism? If most of the growth in the Church is in the 60+ cohort and the inactive cohort, the church would maintain its ability to keep growing (at a rate of 300,000 per year), but wouldn't be increasing its ability to grow faster--i.e. would be experiencing nominal linear growth rather than exponential. I think this is a good graph. I also never really thought of the growth as linear, good job Physics Guy. I do wonder from the graph above what happens to this number when those aged 60+ start to leave this mortal realm in 30 years (or 50 when nano-robots are developed fix our bodies😉). I don't think it will stay at 1 in 50. "Computer where would be the best place to start a church now?" Computer: "Central Africa would be a good start, but you better hurry, The Adventists have a head start on you." "Noted. Free hamburgers on Saturday if you commit to talk with missionaries..."